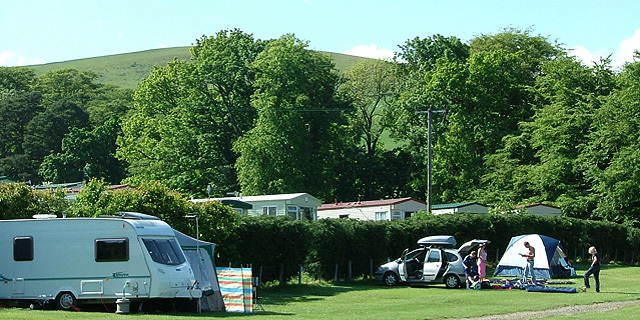 We keep things simple so you can have a brilliant camping and touring holiday in the Scottish Borders – that means we’ll provide easy access to the park and your pitch, modern amenities and acres of space for you and your family to enjoy Scotland’s great outdoors. Rosetta Park has more than 140 pitches for tent and touring holidays. With wonderful views of the Venlaw Hills, award-winning Peebles town centre only a 10-minute walk away and the majestic landscapes of Scottish Borders on our doorstep, it’s no wonder that Rosetta Park is such a popular destination. Our mix of grass and hard-standing pitches for touring caravans and motorhomes all have electrical hook-ups, and our grass pitches for tents come with or without hook-ups for electrics. Most importantly, our amenities including hot and cold water, individual shower cubicles, toilets and wash basins, washing up areas, shave points, baby changing and disposal for waste and chemical waste. Our friendly team are on hand throughout the day to give you all the help you need, whether settling in or planning a day out. You can book by day, week, month or even for the entire season and any-day start dates are available – take a look at our great value prices for camping and touring at Rosetta Park. Hayloft Bar for relaxing evenings of delicious bar food (Open at weekends from April to end of September).